Reverend Peyton's Big Damn Band at Club Congress Tuesday night in a KXCI Presents show. 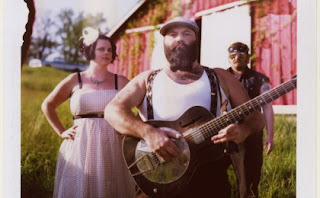 The Reverend Peyton’s Big Damn Band is a 3-piece American roots blues band from the Indianapolis area with the Reverend Peyton on acoustic guitar and dobro, the Reverend’s brother Jayme Peyton on the drum kit, and the Reverend’s wife Breezy on washboard. They play original music in the style of Mississippi delta blues musicians of the 1920s and 1930s. Doors open at 8pm with Trapper Schoepp and the Shades, learn more at HotelCongress.com.